An international team of astronomers discovered a giant gap inside in PDS 70’s protoplanetary disk, which may have resulted from the birth of multiple planets. A large international team of astronomers led by Jun Hashimoto (National Astronomical Observatory of Japan) and Ruobing Dong (Princeton University) has used the High Contrast Instrument for the Subaru Next Generation Adaptive Optics (HiCIAO) to observe and examine PDS 70 (Note 1), a young star about 10 million years old with a mass similar to that of the Sun. Images captured from the observations clearly show a giant gap inside the protoplanetary disk, the largest ever found among lower mass stars similar to the Sun. A protoplanetary disk is where planets form, and the gravitational force of newborn planets may account for the huge gap between the inner edge of the disk and the central star. No single planet, regardless of how heavy or efficient it is in its formation, is sufficient to create such a giant gap. The researchers think that the gap in PDS 70’s protoplanetary disk may have resulted from the birth of multiple planets. 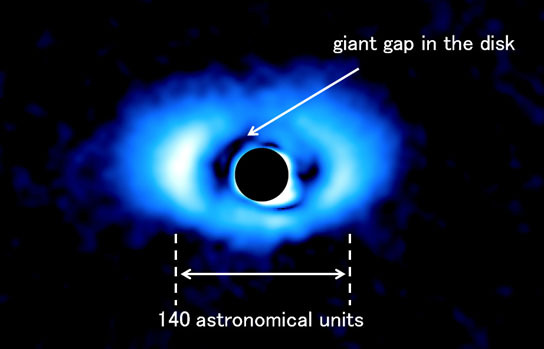 The high contrast images from the observations allowed the researchers to study the details of the disk, which then enabled them to directly reveal the site of formation of one and possibly more planets. The research team is now attempting to detect those planets. Protoplanetary disks occur around many Sun-like stars; they are composed of gas and dust that surround the stars and provide the materials out of which planets like the Earth form. Researchers conduct observations of protoplanetary disks to understand their evolution and the formation of planets within them. Disks around heavier stars tend to be more extended and brighter, hence easier to study in detail; those around less massive stars pose more of a challenge to research. The goal of the Strategic Exploration of Exoplanets and Disks with Subaru (SEEDS, Note 2) Project, begun in 2009, is to study the disks around less massive stars like the Sun. As part of the SEEDS Project, the current team chose to target PDS 70, which is located in the constellation Centaurus; is about 460 light years from Earth; and has a mass 90% that of the Sun. Estimated to be about 10 million years old, this is a very young star relative to the 10 billion year life span of Sun-like stars and the 4.6 billion year age of our Sun. Previous observations of the spectral energy distribution and direct imaging by the Very Large Telescope in Chile suggested the presence of a disk, but were not able to determine the details of its structure. The observations with HiCIAO mounted on the Subaru Telescope clearly show a low-density space between PDS 70 and the inner edge of the disk surrounding it, with a radius as large as 70 astronomical units (AU, the distance between Earth and Sun). Figure 1 shows a darker area in the vicinity of the star, which means there is less material in the area. The high contrast images from HiCIAO enabled this discovery. The huge size of the gap in the disk around PDS 70 led the team to question how the gap formed. By studying the details of the spectral energy distribution (plotting the brightness of light vs. wavelength) of the star itself and the disk, they found another disk at a distance of only 1 AU. Figure 2 illustrates the double disk structure. The inner, much smaller disk is very close to the star, but the current observation does not clearly show that part of the disk because it is behind HiCIAO’s mask that blocks the bright light from the central star. Gravitational forces from the planet(s) embedded in the disk might account for this kind of gap in the disk, because they could pull away the material from the disk, and the clearing of the material means less infrared radiation from that area. It would be very difficult for a single planet to create the giant gap in the disk around PDS 70. The research team thinks that more than one planet could be responsible for creating the gap. However, conducting observations to detect such planets is difficult, because the scattered light from the disk can obscure the very faint light emitted from planets. The team is aware of the challenge posed by the contrast between very faint planets and their bright host stars. In addition, the high activity and variability of the light of young stars makes observations even more difficult. The detection of giant planets is easier, because they cause more gravitational perturbation in the disks. 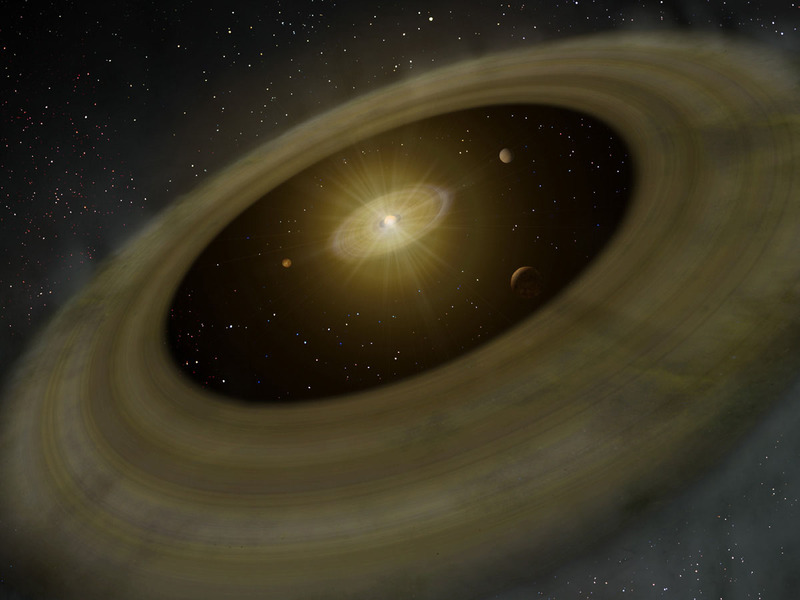 Because big planets create wider gaps in disks, their planet-induced structures are easier to observe. “Our SEEDS study of systems like PDS 70, which has a giant gap that may have been carved out by multiple giant planets, opens up a promising path for directly studying planet formation in disks,” Ruobing remarked. Hashimoto et al. “Polarimetric Imaging — PDS 70: Observations of the Disk” was published in ApJ Letters on October 10, 2012 (ApJ 758, L19). Dong et al 2012 “The Structure — PDS 70 System” is in press in ApJ. 1. PDS is an abbreviation for “Pico dos Dias Survey”, a catalog name based on the 1990s large-scale survey at Pico dos Dias Observatory in Brazil. About a hundred objects were listed in the catalog. The 70th object on the list was the target of this research. Therefore, it is referred to as PDS 70. 2. The Strategic Exploration of Exoplanets and Disks with the Subaru Telescope (SEEDS) group used its high performance planet and disk imager, HiCIAO, mounted on the Subaru Telescope to conduct its research. The SEEDS Project began in 2009 for a five-year period using 120 observing nights at Subaru Telescope. Project leader Motohide Tamura is the director of the Extra-Solar Planet Detection Project at the National Astronomical Observatory of Japan (NAOJ). Be the first to comment on "Giant Gap PDS 70’s Protoplanetary Disk May Indicate Multiple Planets"